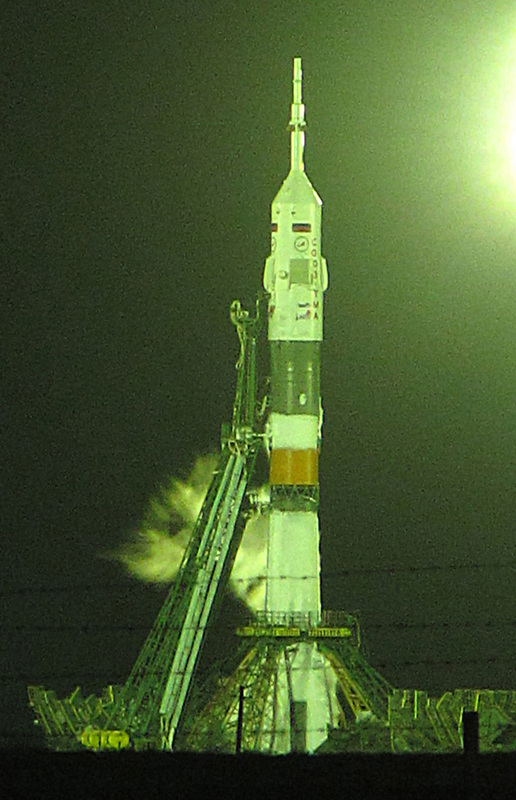 I visited the Baikonur Cosmodrome on Dec 14th-17th 2010 for the Soyuz TMA-20 launch. (Here are highlights and a photo archive.) For anyone considering this trip, here are a few details on tour logistics. Baikonur is inside of Kazakhstan but is under Russian administration. It is a secure zone, with controlled access. You can NOT travel around Baikonur on your own. You need to have special permission from the Baikonur authorities, which means that you need to travel as part of an authorized tour group, with a guide. It can take up to 45 days to get this permission, so book early. We flew from Moscow to Baikonur. At the Baikonur airport there were both Russian and Kazakh officials meeting our flight. Our Baikonur guide was waiting for us, with a permit listing our names. The Russian official looked quickly at our passports to check that our names were on this approved list and then waved us through. Our passports were not stamped. The tour permit meant we had permission to visit the Baikonur area, but not to enter the rest of Kazakhstan. I asked our guide what would happen if I had a Kazakh visa? She assured me that in that case I could ask the Kazakh official at the airport to stamp a Kazakh entry stamp into my passport and then I would be able to travel on into other parts of Kazakhstan. Note that I didn’t actually try it, and perhaps my guide was mistaken. But it seems like a plausible solution: there must be occasional travellers who would like to enter at Baikonur and then travel to other parts of Kazakhstan. You will need a double-entry Russia visa if you plan to fly back to Moscow. During the tour, our guide was always with us. There were frequent security checkpoints inside the Cosmodrome. I think our guide was supposed to stay with us even in Baikonur City itself, but in practice no one seemed to mind when I quietly wandered out of the hotel and strolled around the city on my own. The tour companies will schedule your trip around the available flights. For example, with the current Ural Air schedule, for a Wednesday launch they would fly you in on Tuesday and back out on Friday (a four day tour). For a Monday launch they would fly you in on Friday and out on Tuesday (a five day tour). If you are very lucky, you might arrive two days ahead of the launch, in which case you will be able to see the Soyuz rollout from the assembly building to the launch pad. The tour companies promise this as a feature of their tours, but you need to be a little lucky for the flights and launch times to align correctly. Several Moscow tour agencies offer Baikonur tours from Moscow. I went with Country of Tourism (aka BestRussian) who currently charge 3200 Euros for a shared room or 3500 Euros for a single. RusAdventures also look good, they currently charge 4600 dollars. The Moscow agencies don’t actually operate the tours themselves. In Baikonur we were met by a guide from a local Baikonur company “TourService”, who told us they operated all the tours from Moscow. So the main differences between the Moscow agencies are in the support they offer at the Moscow end (for example RusAdventures include Moscow airport transfers and a Moscow hotel stay before and after the trip). Also, keep an eye on whether they are promising a single room, as unless you are explicitly promised a single you may find yourself sharing with a stranger. This happened to two people in our group. I was happy with the support offered by BestRussian. They did a good job of keeping me up-to-date on the shifting launch schedule and were helpful on Moscow departure and return. In 2008 I was visiting Kazakhstan and I tried to arrange a visit from Almaty to Baikonur for a Progress cargo launch. But I failed miserably. I tried to contact about six different agencies who claimed to offer Baikonur launch tours, without getting anywhere. The normally very helpful StanTours gently advised me that they were unable to recommend any tour agency. You may have better luck, but it seems that the launch tours are targeted at tourists coming from Moscow. If you want to try visiting Baikonur from Kazakhstan, I would suggest contacting TourService in Baikonur and perhaps arrange for them to pick you up and drop you off at the Baikonur train station (the station name is Tiuratam aka Tyuratam). The Lonely Planet Central Asia guide doesn’t have much to say about Baikonur. The Bradt Kazakhstan guide is much better, with eight useful pages, but no map. Baikonur city maps are hard to find, but TourService gave us a detailed city and cosmodrome map as an arrival gift. The Russian space agency RosCosmos publish frequent English language press releases, including lots of information on the progress of any upcoming launches. CBS news publish detailed launch schedule information. A broader overview of upcoming launches is available at SpaceflightNow. Our tour group in December had a total of six people. We were told we were all the tourists visiting the launch. There were also press and various Roscosmos/ESA/NASA guests, but still probably under 200 total observing the launch. Our little group of six travelled in a small minibus. Having such a small group worked out really well. Most of us were of course really keen space buffs. We were told there might be as many as 100 visitors for a summer launch. “Half students, half tourists”. Apparently people avoid winter launches from a fear that they will be very cold. In fact in December it was only a few degrees below freezing; it felt chilly rather than arctic. Based on my experience I’d recommend a winter launch: the small group size made up for the chill. Baikonur is in a very dry area, so you are unlikely to see much snow. At Baikonur, we were put in the soviet-era Tsentralnaya Hotel. This is a little dated and basic, but quite adequate. We were taken to a nearby restaurant for all our meals (including breakfast). The food was good and plentiful! The tour companies make various claims about how far you will be from the launch. This will vary a little depending on which pad is used. The TMA-20 launch was from the Gagarin pad (hurrah!) and according to my GPS log, our observation point was 1.4 km (0.9 miles) from the pad. Which is pretty good. We were allowed to drive over to the pad about one hour after the launch. We were allowed up to about 50 meters from the pad, so we saw the launch gantries up quite close. But (despite what the tour companies promise) we were not allowed near the flame pit and we did not get to feel any warm concrete! visit the unexpectedly interesting International Space School, a local children’s school which just happens to be well stocked with original artifacts from the Soviet space program. visit Gagarin’s cottage, Korolev’s house, the Gagarin summerhouse, etc. visit various monuments in Baikonur City, including laying flowers at the Nedelin monument. The tour was well organized and our guide was very helpful. At various of the sites there would be an on-site Russian speaking guide and our guide would translate. 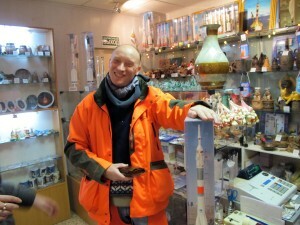 For souvenirs we were taken to Baikonur’s main market, where a few stalls sell mostly Kazakh souvenirs (e.g. hats and toy camels). 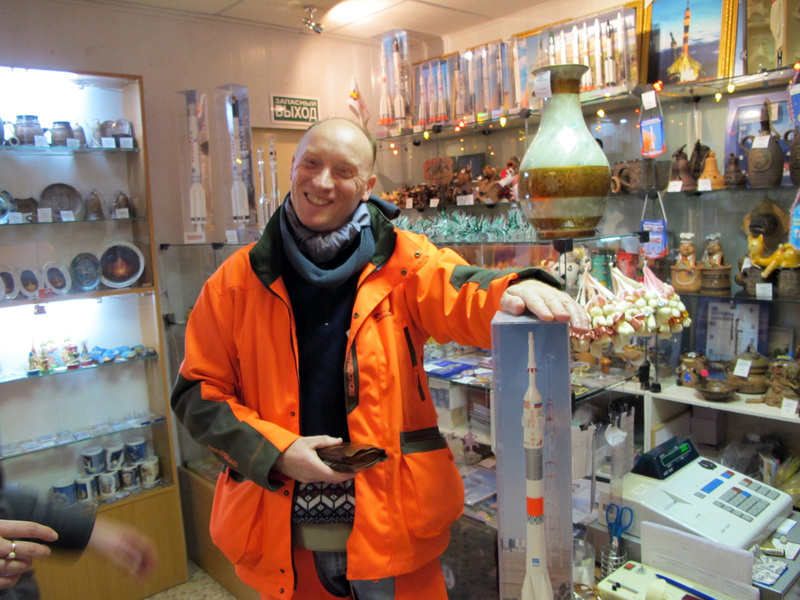 Led by a very determined rocket-seeking Frenchman, we eventually hunted down a good selection of space related souvenirs (such as model Soyuz rockets) cunningly hidden in an optician’s shop. Take the Arbat about two blocks north from the main square, and look for a small optician’s about ten meters west down a side street. Overall it was a really fun trip. If you are a space buff, I strongly recommend it! If you are planning a Baikonur trip and have any questions, feel free to email me: “author” at the site “thewanderingscot.com” and I’ll do my best to answer.